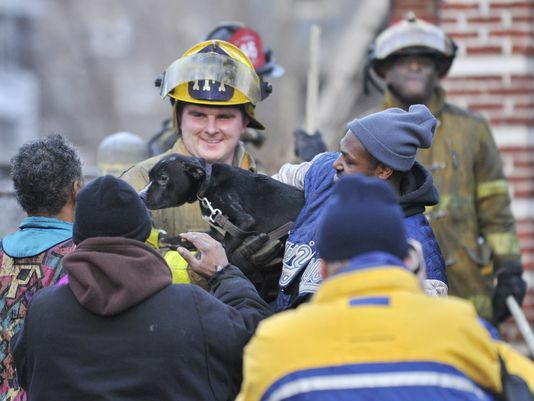 Detroit firefighters had a busy, and heroic, Monday, rescuing two people and a dog from blazes in the city. Crews rushed to the 16000 block of Marlowe on the city’s east side about 3:30 p.m. to battle a blaze. Inside, they found two people, who were transported to Detroit Receiving Hospital for treatment of burns, said Edsel Jenkins, the city’s executive fire commissioner. 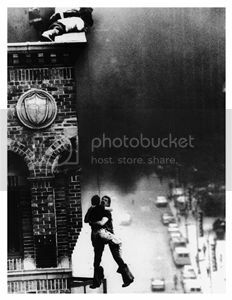 No one else was at the home when the blaze started, he said. Another fire was reported about 4:06 p.m. in the lower level of a home in the 2200 block of Field on the city’s east side, according to the Detroit Fire Department. A trial firefighter pulled a dog inside to safety, Jenkins said. 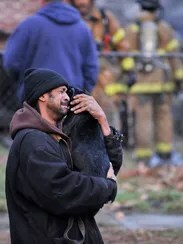 The owner tearfully held onto the black dog, saying he’d lost most of his belongings in the fire.